You will earn 258 Points for purchasing this product. If you’re an angler who likes the space of a bivvy but wants the mobility of a brolly system then this is the perfect compromise for you. Offering a compact footprint combined with a spacious interior, the Trakker Tempest Air V2 is the perfect hybrid system. It is modelled on Trakker’s original Tempest system, which already has a cult following among the serious carp anglers out there. However, the big difference between this Air V2 and the original Tempest is footprint size. 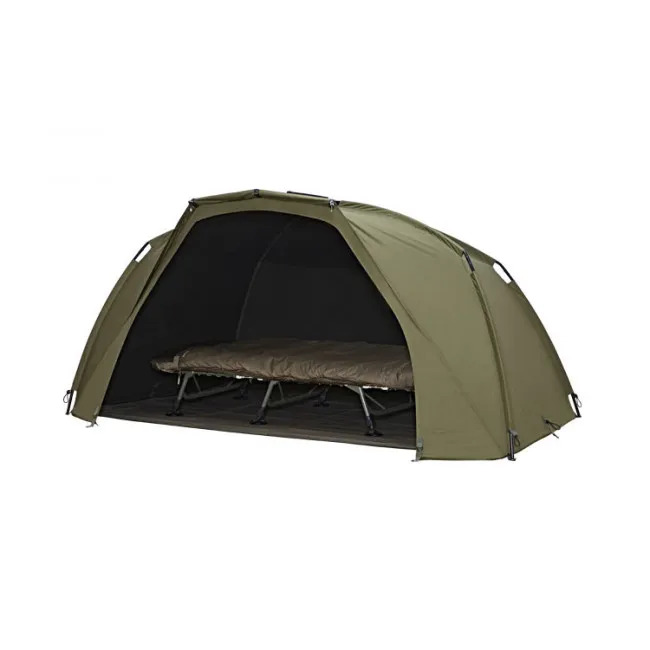 The Tempest Air V2 is 265cm wide, 210cm deep, and 130cm high, as opposed to the Tempset bivvy’s W270cm x D240cm x H140cm. This incrementally smaller size makes a huge difference to the footprint of the shelter on the bank, allowing you to target the smaller and more compact swims with confidence. In fact, this shelter is perfect for the angler who likes to target fish using the stalking method and it is great for the riving angler. The transport size of this bivvy is 128cm x 22cm and it weighs in at a mere 9kg (including your groundsheet and pegs, the shelter alone weights 6kg). Thuis makes it makes a great compact addition to any angler’s arsenal. Like the original Tempest, the Trakker Tempest Air is manufactured from Aquatexx. This is a specialist material which has been specifically developed with angling in mind and it continues to set the bar for waterproof and breathable bivvy fabrics. This makes this shelter ideal in rainy conditions when want to keep all your gear (and yourself) nice and dry, even if you’re not planning on spending the night in the swim. A rain gutter along the front of the shelter stops water from running over the edges of the shelter, potentially dripping down in front of your face, and instead directs the water down the sides of the Tempest Air. The Tempest Air V2 might have been intended for intended for short stops and quick overnighters but that doesn’t mean that is can’t be the perfect compact solution for the longer session. Its open front makes it ideal for summer angling, when the light stays with you late into the evening and the heat of the day lasts throughout the darker hours, and it is very popular among anglers who travel overseas to target European venues and want to keep their luggage to a minimum. There is an overwrap available to purchase separately, too, which transforms this shelter into a fully fronted twin skin bivvy. This is ideal for the cooler months, as well as for the angler who likes a little more privacy whilst they sleep. The footprint of this shelter is more than large enough to house a standard bedchair and luggage, or your barrow and chair for a shorter roving session. One of the biggest benefits of the Trakker Tempest Air V2 is its exceptionally quick septup. Simply slot the ribs into place and open out the outfit. It feats a unique tension opening on the top of the shelter, which not only makes setup speedy but it also maintains the shelter’s structural integrity. All that is left to do is to peg the shelter down – either minimally for a short stay or more robustly for a longer session. You can add the three-quarters groundsheet, too, should you want additional protection from the elements. Front quick stick poles provide a rigid opening and further support to the shelter in high winds. The shelter also features two Velcro rod retainer straps, which are ideal for keeping your carp rods safe and secure. If you’re an angler who doesn’t like to be encumbered with a bivvy but you want versatility that a brolly system can’t offer then this Trakker Tempest Air V2 is the ideal solution for you. Super light and quick to put up! Loving it!! Put it up in garden going to use it over exmas break love it. Unreal how fast this is to put up, it's oozes quality iv always been a brolly angler but fancied a bit more cover and this ticks all the boxes! 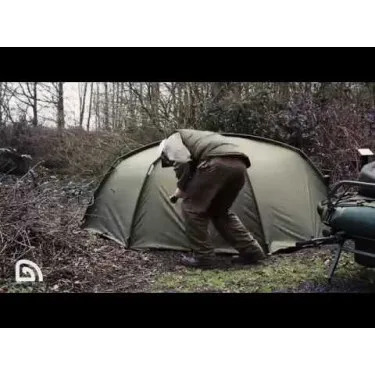 Anyone looking for a lightweight high quality shelter should deffo give this a look!